Hi all! I'm back again. There is a bullish divergence on all oscillators I use. EU found support in the 2927 to 2937 4H support area. There is price action a dividing line @1.2974 zone on the 1H TF. Here's the first 4h chart with all the trend lines and the mess. I'll clean it up later. What is the trend on 1H TF? Some could say is down and some that is neutral ATM. 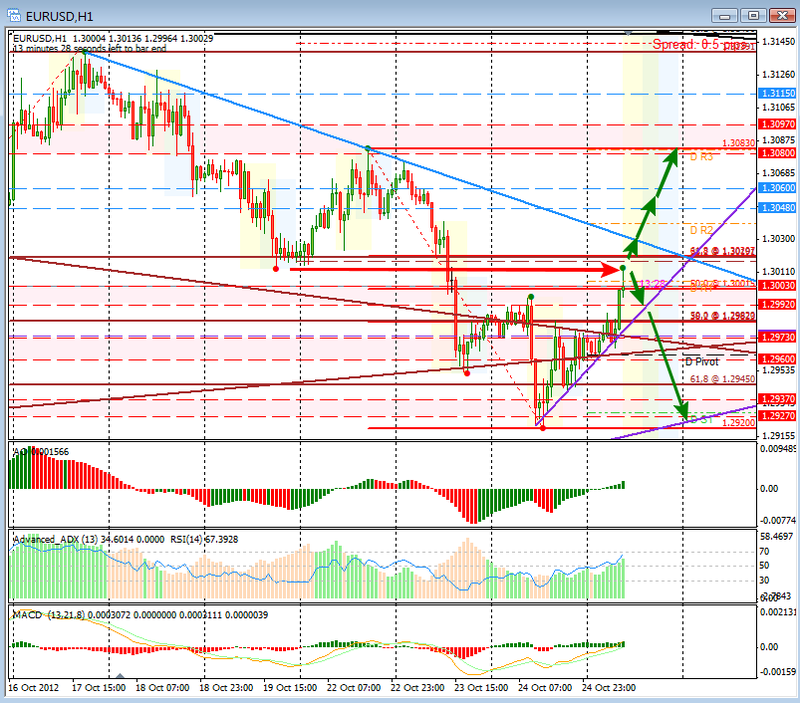 I still think that the trend is down until the pair makes a HH above 1.3000 level. In the very short term above 2874 more bulls below more bears. Two trend lines in the zone tightening. The purple one on the bottom of the pic is a rising daily trend line. It's tricky now on this levels ..
Support and resistance all on the charts + 2 trend lines .. recipe for more consolidation? There was some bullish move, but only a pullback and then continuation south. Remember: every SR level/zone can be a reversal one. The arrows are just of informative nature. Trade what you see and not what you want to see! i framed this compression much the same as you. i am of the opinion this will go down a bit and have placed a short limit order accordingly. a move above the horizontal level of around 2982 will negate the entry. to me the last couple of moves down have looked impulsive and the moves up have looked more corrective so i m thinking one more move down to just above the 2900 may be in the cards if it moves below the 2955 to trigger the entry. no sooner did i post this and the market moved above the 2982 negating the entry . we ll watch and see what happens for a while now. Tnx talisman for your updates. Above the updated H1 chart. 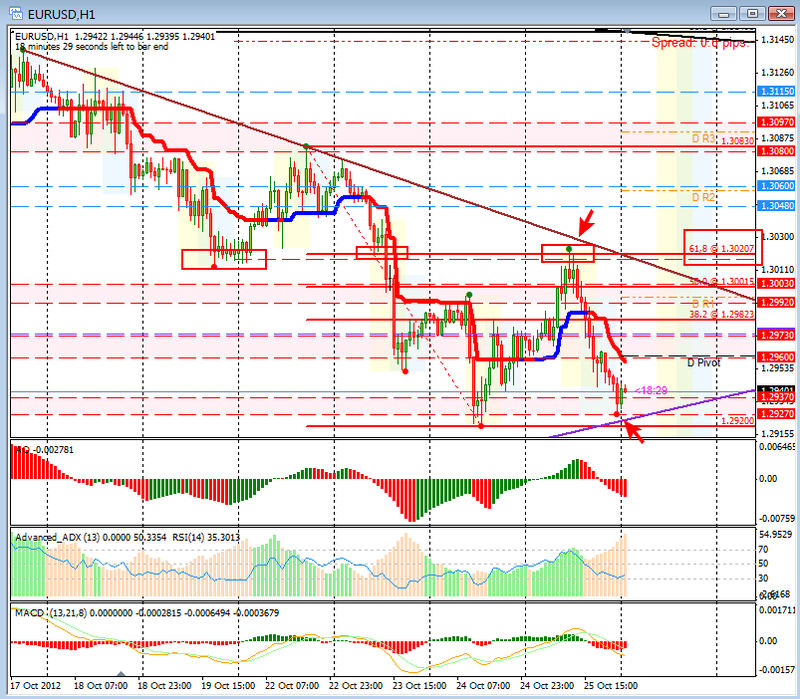 The bullish divergence was good enough to push the pair up to the 61.8% fib retrace of the last 4h swing down. Around WCP the price reversed and made a straight but slowly dip to the support zone between 2927 and 2937 – also in line with the daily rising trend line. For now we still have a HL.